Maces first appear as weapons in the pre-historic era. They were used in some cultures in the Mesolithic era and were almost universal in the Neolithic era. Maces are quite possibly the first purpose-built weapons. All other stone age weapons (spear, bow and arrow, knife and axe) are in fact adapted from hunting tools. 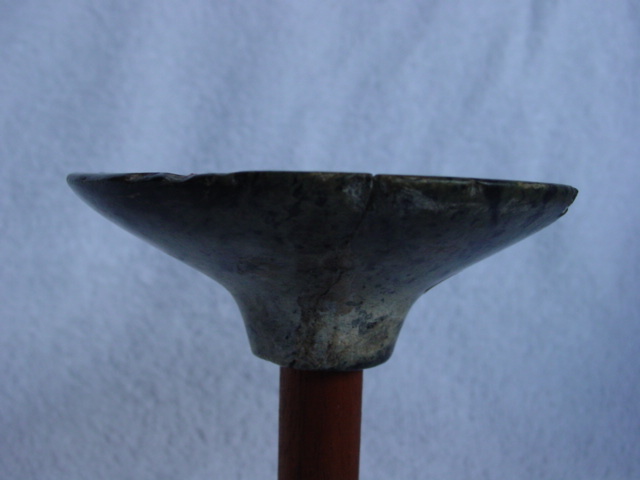 The first maces were simply rounded rocks lashed to a wooden haft. Later, the rocks were shaped to make the lashing easier with grooves or indentations to keep the rawhide or other bindings in place. Drilled maces appeared by the late-Mesolithic era. These maces had a central hole for the haft. Drilling this hole was a huge technological challenge in a pre-metals society. 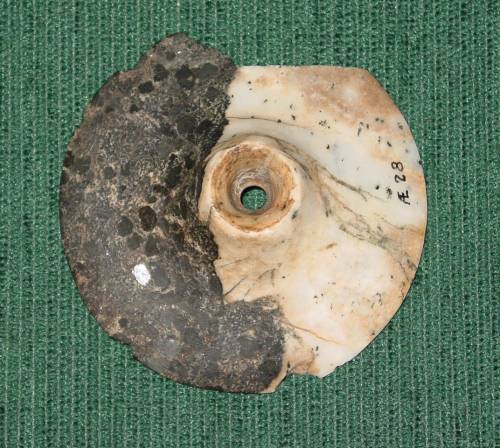 Many of the earliest drilled maces show signs of rotary drilling. However, it is not known if they were simply drilled right through, perhaps with the use of a bow-drill, or if other techniques were used. In Stone�s Glossary of Arms and Armour, British adventurer Wilfred Powell is quoted as reporting that even in the 19th century, the indigenous peoples of New Guinea and New Britain drilled holes in stone mace heads by dripping cold water onto fire heated stone causing chips to fly off. Once a rough hole had been formed it could be smoothed by other methods. 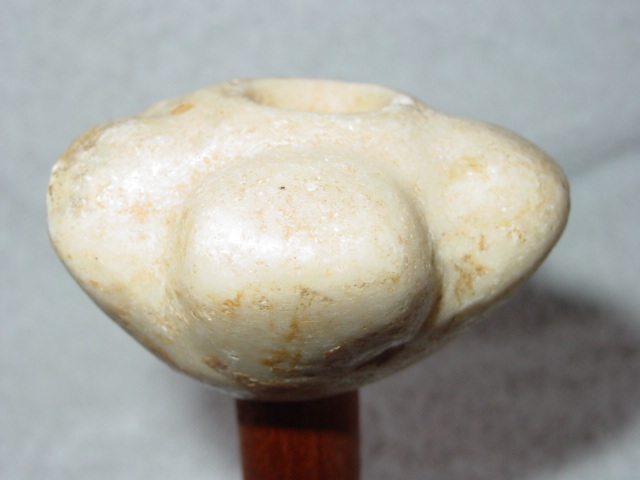 Before the end of the Neolithic era mace heads came in many shapes - round, oval, pointed, and even stylized anthropomorphic heads. The stone age is more a definition of technology than a specific form of dating. Stone age maces were made as early as 8000 BC in some areas of the Near East but continued to be made much later. In Britain and the Baltics stone maces were being made by the neolithic cultures of the 2nd millennium BC. 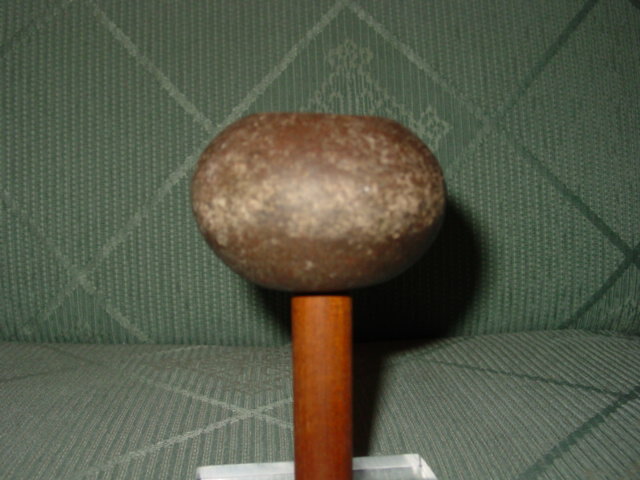 In the pacific basin stone maces were made into the 20th century. Stone maces were used by the earliest historic cultures. While there is some evidence that pre-historic maces were often symbols of power as well as weapons, this is certainly the case in all the early civilizations. 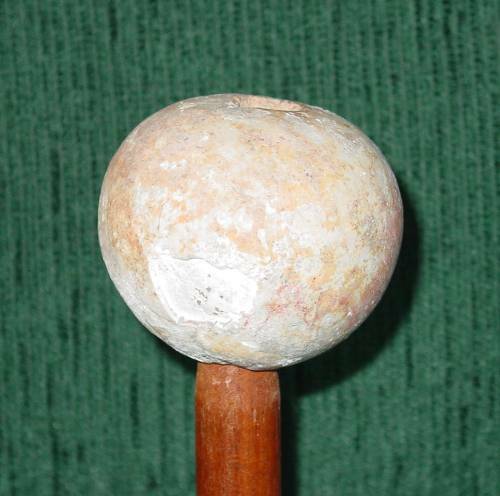 Stone maces of the historic era tend to be more refined than their pre-historic counterparts. They are more highly polished, often from harder and more elaborate stone and come in a wider variety of often more complex forms. The earliest of the historic era maces are the disc maces of pre-Dynastic Egypt, Naqada I period circa 3900-3600 BC. Piriform (oval or pear shaped) mace heads appear in Egypt circa 3600 BC and were widely used through the Naqada II and III period, to roughly 3000 BC. Piriform mace heads were also used in Mesopotamia and other parts of the Near East at this time. 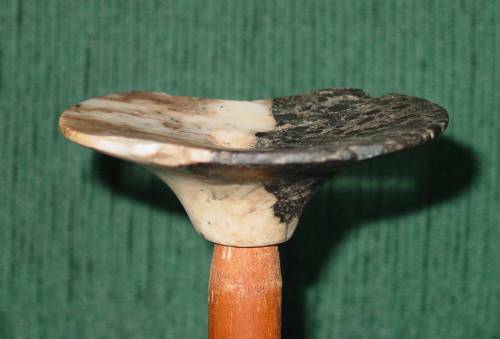 Disc maces were only used during the Naqada I period in pre-dynastic Egypt, circa 3900-3600 BC. 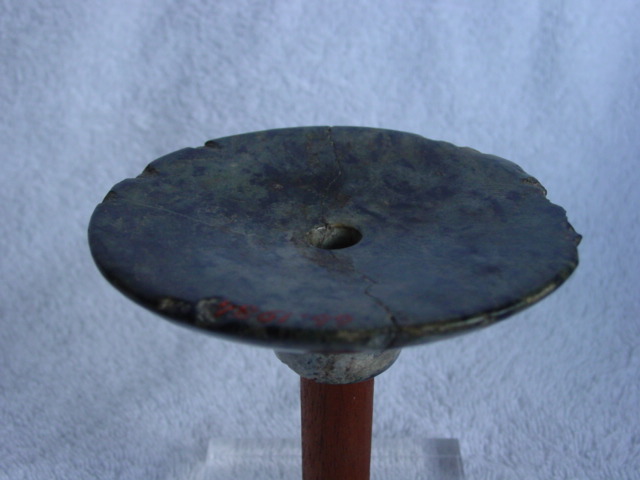 Disc maces were made of stone and represented the height of late-neolithic technology. These maces are extremely well made. Boring a hole (of tapering diameter) through the centre, making a concave depression in the top, forming the hourglass shape of the lower part, and smoothing the entire piece are signs of extreme sophistication in a pre-metals society. It is no wonder that such maces were signs of authority. It is possible that disc maces were meant to mimic the sacred lotus flower in form. In side view they look much like the traditional Egyptian rendering of the lotus head. This particular example was once in the famous Heeramaneck Collection of Oriental Art and has been displayed, on loan, in the Boston Museum of Fine Arts. It was also part of the collection of the famous American Archeologist Dr. Kelly Simpson. It was broken in two at one point (I don�t know whether it was found like that) and has been professionally restored. It still has old museum inventory numbers on it. This mace is 10.3cm in diameter and 3.85cm high. The hole tapers from 1.78cm (bottom) to 1.0cm (top) in diameter. It weighs 0.275kg (0.6 lbs). It is made of green speckled dolomite. This mace is similar in form to the one shown above, although it is slightly smaller. It is made from a high quality of stone, typical of the Naqada I period. In this case white and black speckled diorite carefully chosen so that the shaft hole goes though the edge of the colours creating an almost �yin-yang� like pattern. There is one major and several smaller chips missing from this mace head. This mace is 9.2 cm in diameter and 3.2 cm high. The hole is 1.6 cm diameter at the top and 2.0 cm diameter at the bottom but tapers to a very narrow 0.65 cm. It weighs 0.13kg (0.3 lbs). In this bottom view of the mace head you can see the shaft which curves down (or in this view up), the marks of rotary drilling and the very narrow haft diameter. 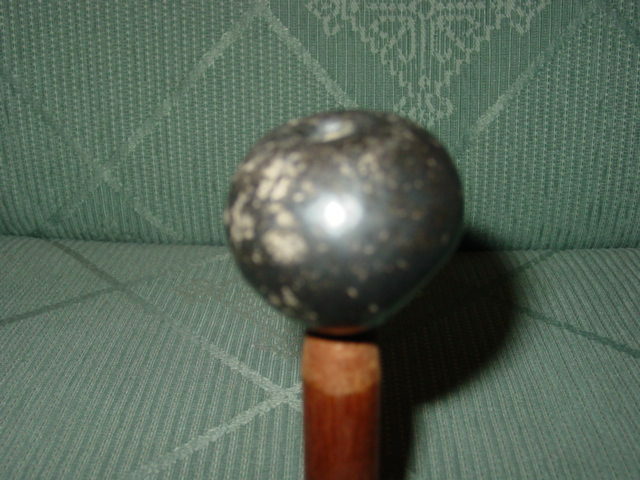 This disc mace is quite different from the above two examples. It is of a slightly later design. It is almost pyramidal in cross-section and lacks the gentle hourglass tapering of the previous types. It is much smaller than the other two and is made of simple black basalt. This mace is probably an offertory mace head which was placed in an Egyptian temple or tomb in honour of one of the gods. It is to small to be an effective weapon or impressive sceptre. 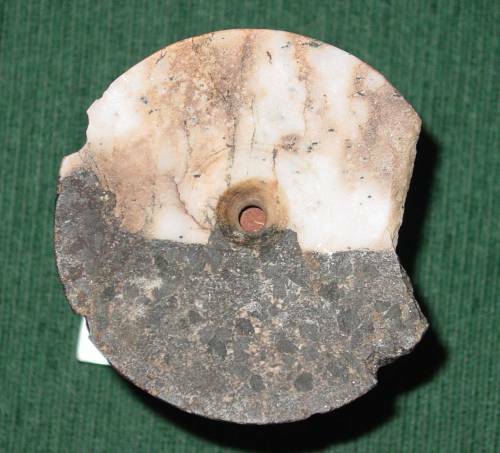 The form comes from the end of the Naqada I era (circa 3700-3600 BC) but these offertory disc mace heads may have been used into the Naqada II and III eras. The mace head from all angles. This mace is 5.0 cm in diameter and 3.45 cm high. The hole is 0.85 cm diameter at the top and 0.9 cm diameter at the bottom but tapers to 0.7 cm. It weighs 0.065kg (0.14 lbs). 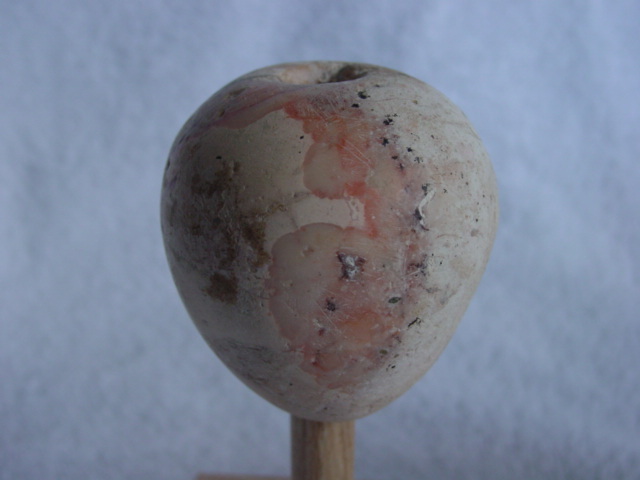 While I originally thought (and was told) that this piriform mace head was from Egypt, dating likely to the Naqada II or III era (circa 3600-3000 BC), I now believe that it may be a Mesopotamian mace head from the 3rd millennium BC. Piriform mace heads were very similar in both Egypt and Mesopotamia and this form was found in both. However, the exact shape is more common in Mesopotamia. Also, maces made of very similar stone have been found in Mesopotamia including a Sumerian example circa 2500 BC and an Akkadian example circa 2200 BC. This mace is 5.26cm in diameter and 5.45cm high. The hole tapers from 1.4cm (bottom) to 1.1cm (top) in diameter. It weighs 0.20kg (0.44 lbs). 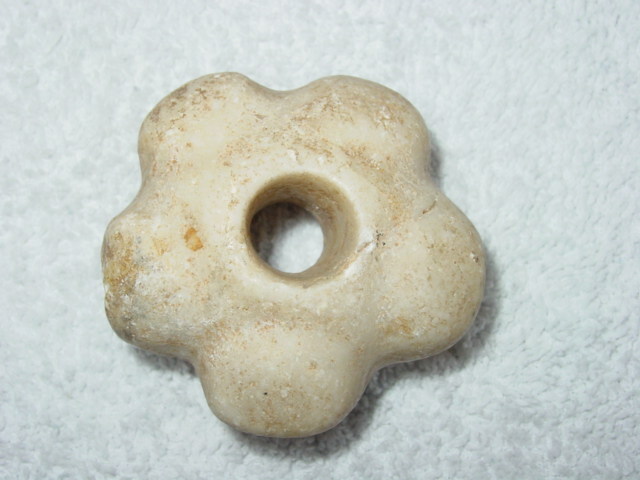 It is made of white and rose stone, perhaps marble and/or limestone. It is also impossible to tell the exact origin of this mace head. The slightly squatter piriform shape is also found in both pre-Dynastic Egypt and early Mesopotamia. I can find no exact parallel to the pattern of roughly diamond shaped incisions stained or painted a terra cotta colour. Mace heads decorated with any pattern are more common in early Mesopotamia then pre-dynastic Egypt. However, incised diamond patterns are common in later, dynastic Egyptian art. One of the gilded wooden statues guarding the entrance chamber to the tomb of the young New Kingdom pharaoh Tutakhamun clutches a mace with a head the exact shape of this one with a diamond pattern. This mace is 5.6 cm in diameter and 4.6 cm high. The hole is 1.8 cm diameter at the top and 1.65 cm diameter at the bottom but tapers to 1.1 cm. It weighs 0.2kg (0.44 lbs). It is made of hard white marble. The unevenness of the haft hole is visible in this overhead image. This mace head is an interesting variation on the piriform pattern. The mace is still piriform in side view but actually has a flower-shape with five rounded knobs or lobes. While some lobbed maces have been found in Egypt they are not of this exact form and are thought, by Petrie, to originate in Elam (part of Mesopotamia). So it is likely that this mace head too originates from the Elamite lands around Susa in south-eastern Mesopotamia. It is likely late 4th or early 3rd millennium BC. This mace is 6.4 cm in diameter and 3.8 cm high. The hole is 1.7 cm diameter at the top and 1.6 cm diameter at the bottom but tapers to 1.3 cm. It weighs 0.18kg (0.4 lbs). It is made of a hard white stone, likely marble and not alabaster. The very beautiful and painstakingly carved form can be seen in the overhead image. A small but heavy mace of interesting manufacture. 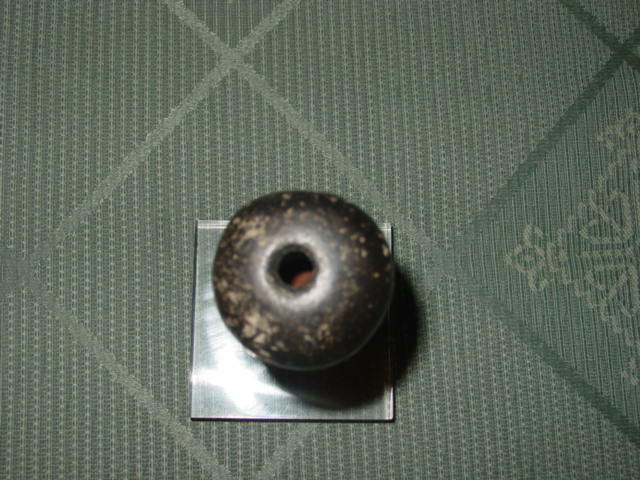 This rounded piriform mace head is made of a grey-brown stone coated in Bitumen (naturally occurring semi-liquid asphalt). The bitumen gives the mace a very hard smooth dark-greenish surface and prevents cracking. 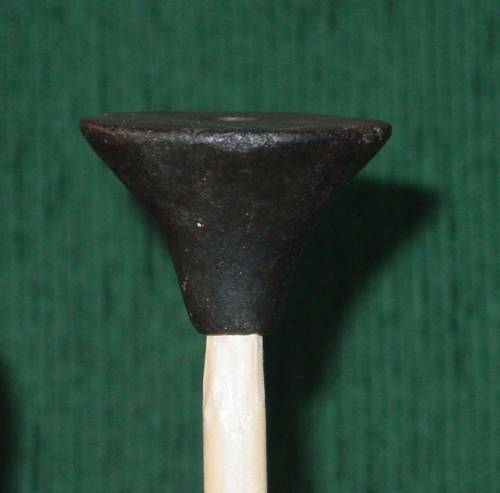 According to the Belgian archeologist Speheers, this type of mace with bitumen coating can be fairly precisely dated to the late Eneolithic (chalcolithic or early copper age) in the 4th millennium BC. Similar heads have been found in Babylon (Merkes level 1) and Susa (Elam). This mace is 4.8 cm in diameter and 4.1 cm high. 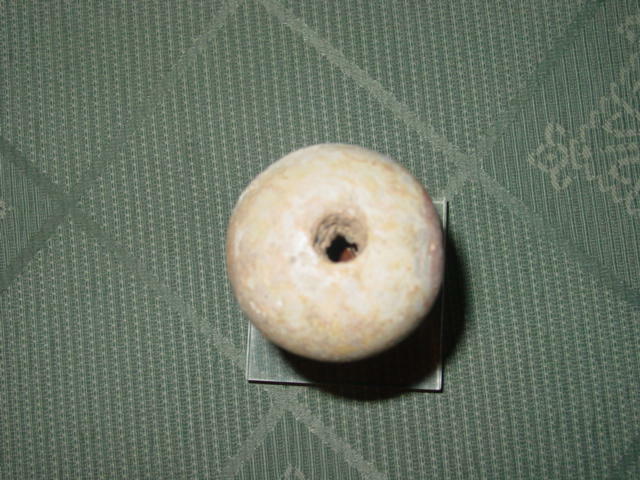 The hole is 0.9 cm diameter at the top and 1.25 cm diameter at the bottom. It weighs 0.22kg (0.48 lbs). 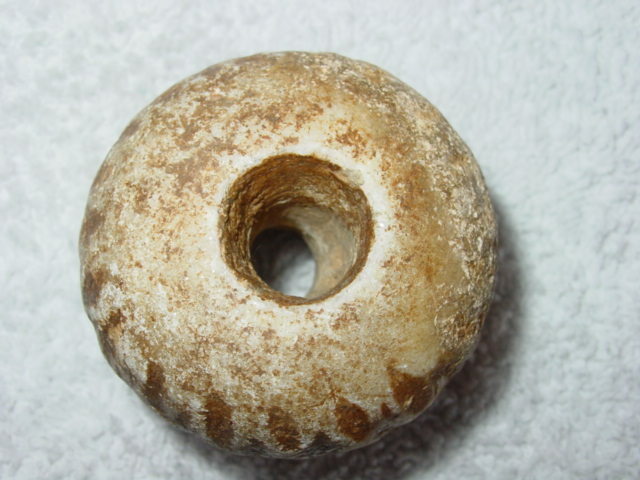 A simple round Mesopotamian mace head, likely from the early 3rd millennium BC. His mace is made from a relatively soft white stone and has had some cracking and flaking. Parts of the mace head are pinkish in what may be a painted design. By the late pre-Dynastic era it was common for Egyptian mace heads, which were made of simpler stone than in earlier times, to be painted in imitation of richer stone. The same may be true of Mesopotamia. This mace is 6.1 cm in diameter and 5.2 cm high. The hole is 1.2 cm diameter at the top and 1.5 cm diameter at the bottom. It weighs 0.27kg (0.61 lbs). Some remaining earth deposits are still visible in the haft hole. 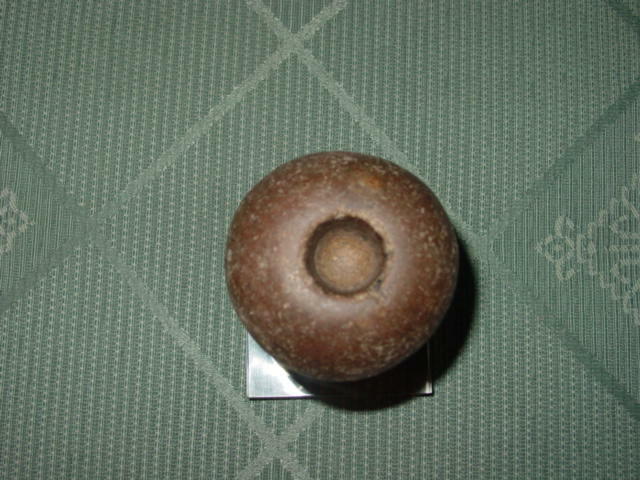 A typical European neolithic stone mace head. 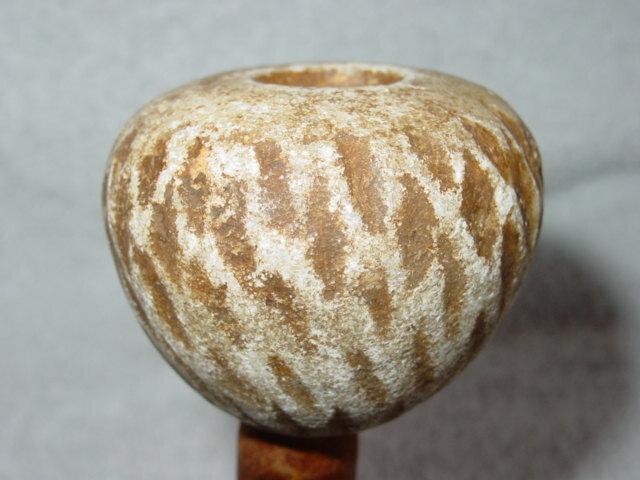 While the exact original of this mace head is not known it is of a type typically found across the continent and throughout Britain and Ireland. Most European round mace heads are much squatter than their Near eastern counterparts. The mace is smooth but not highly polished like the Near Eastern mace heads shown above. The brown stone is relatively light in weight. This mace is 7.25 cm in diameter and 4.8 cm high. The hole is 2.05 cm diameter and 2.0 cm deep at the top and 2.0 cm diameter and 2.4 cm deep at the bottom. It weighs 0.37kg (0.81 lbs). An interesting feature of this mace heads is that the holes (which are definitely drilled) do not go all the way through - although together they go a total of around 4.4 of the total 4.8 cm thickness. I am not sure it this was a completed item which was not meant to be pierced by a haft or if it was an incomplete item found at a �factory� site. It was offered for sale with several other similar mace heads so could have been part of a find of rejects from a �factory� site. Any information on mace heads with similar holes would be greatly appreciated.